A 1929 photo of 8 biplanes & monoplanes in front of the hangar at Bluefield Municipal Airport (courtesy of Tom Hietzman). The original airport for the town of Bluefield was established in 1928. 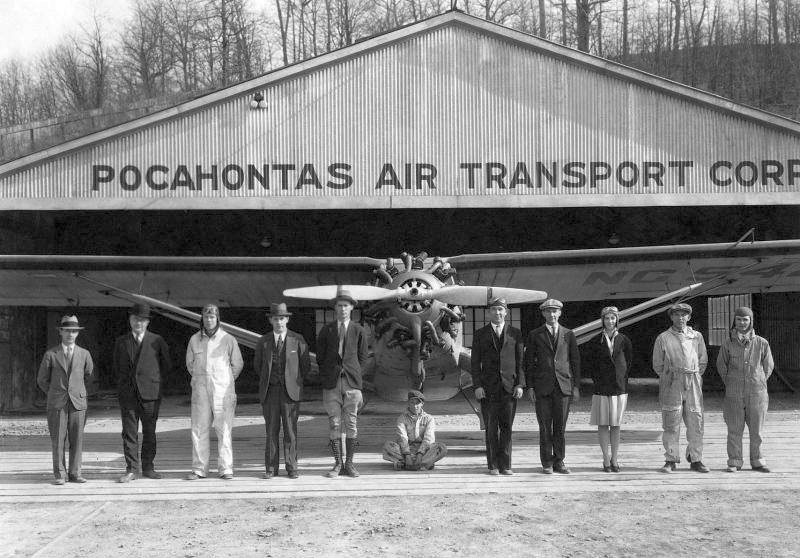 An undated (circa 1920s-30s) photo of the staff of Pocohontas Air Transport Corporation & 3 aircraft in front of their hangar at Bluefield Municipal Airport (courtesy of Rick Harshbarger). in front of an unidentified monoplane at Bluefield Municipal Airport (courtesy of Rick Harshbarger). 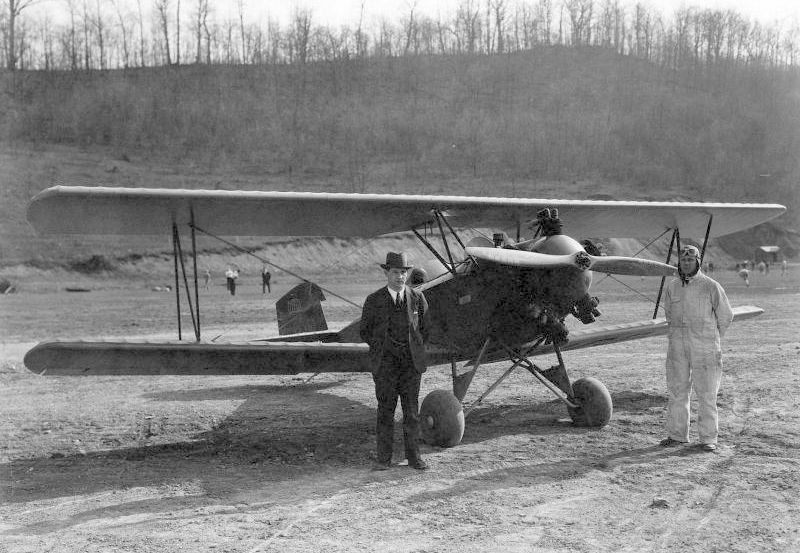 An undated (circa 1920s-30s) photo of 2 unidentified people & an unidentified biplane at Bluefield Municipal Airport (courtesy of Rick Harshbarger). 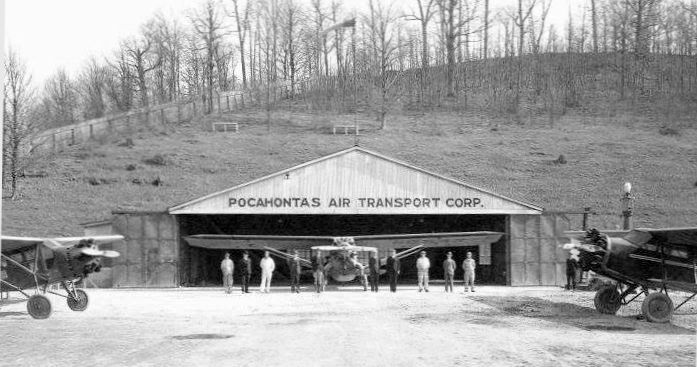 officials of the Pocahontas Air Transport Company announced yesterday. is the fact that during the last few weeks an average of 5 passengers have been carried each day on the line that links Bluefield & Charleston. the local airport, when there is demand for it, operates a passenger line to White Sulphur Springs, where plane connections are made for Washington & New York City. according to Laurence Tierney, general manager of the Pocahontas Air Transport Company. and there are enrolled at this time 11 students, one of them a woman. Low tuition fees & instructors that are unusually competent have combined to attract to Bluefield aviation students from a wide area in southern WV & southwestern VA.
while Harvey Amos, Airport Manager, and Chester Crowell, Chief Mechanic, both of whom hold transport pilot's licenses, also assist with the instruction. the Bluefield Municipal Airport has steadily gained in prestige & usefulness until it has long since taken its place as one of the community's greatest assets. are a few of the many factors that have been contributed to the success of the local airport. by the state of VA & as a result of this action the VA State Highway Department has made extensive improvements to the field without any cost to the operating company. and that the lauding held, from the standpoint of smoothness & size, is unsurpassed in either of the Virginias. The runway at the airport has been lengthened by the state until it is now almost a mile in length. State forces have also widened the field, erected a large marker & made other innovations. Another improvement that is expected to bo started by the state of VA before long is the paving of the road that leads from College Avenue to the airport. When this is done, the scant 5 minutes that are now required to drive from the main part of Bluefield to the airport will be lessened by at least a minute. 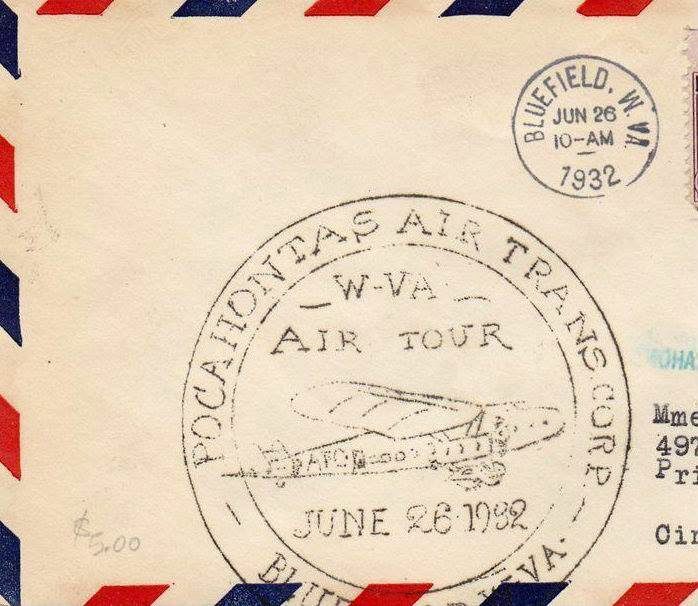 A 6/26/32 postmark commemorating the Pocohontas Air Transport Corporation WV Air Tour at Bluefield (courtesy of Rick Harshbarger). which depicted the field as having an unpaved northeast/southwest cleared area. 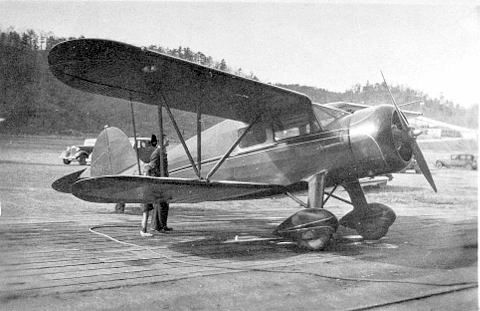 The last photo which has been located of Bluefield Airport was a circa 1941 or later photo by Charlie Bell's father of a Waco biplane (model undetermined) at Bluefield Municipal Airport. Charlie recalled, “Since the field was dirt & gravel it could be a mess when it rained. The plane is parked on wooden slats to keep it out of the mud. Those were the heydays of the coalfields & many coal companies & lumber companies had their own private company planes. The road & structure off of the left wing is the Mitchell Field football stadium. The stadium was built by the WPA in 1941”, helping to date the photo. Its closure was no doubt prompted by wartime restrictions on small general aviation airports. 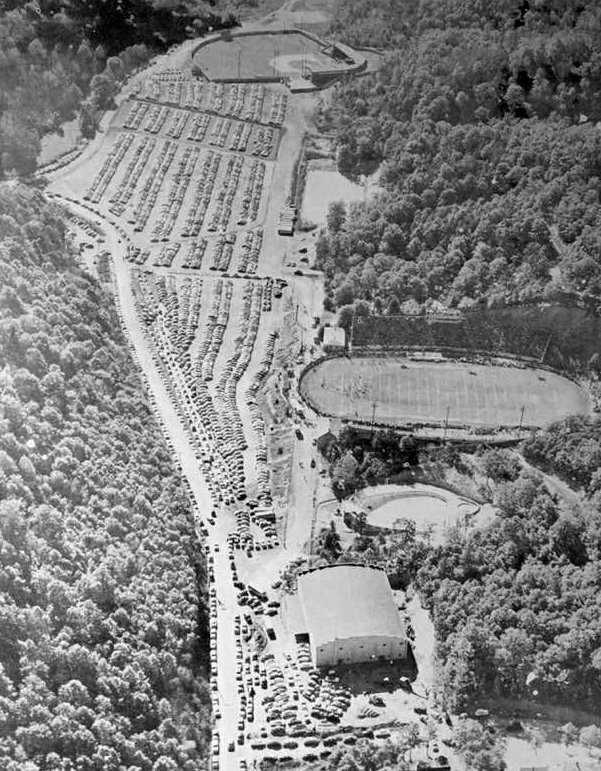 Bluefield Municipal Airport was eventually replaced by the larger Mercer County Airport several miles to the northeast, which opened in 1954.
with the runway covered by the stadium parking lot. Rick reported, “West Virginia & Virginia Tech are playing football at Mitchell Stadium. 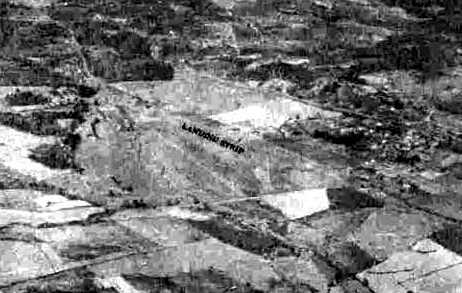 A 1955 aerial view showed the site of Bluefield Municipal Airport had been covered by Bowen Field (a baseball field) & its parking lot. 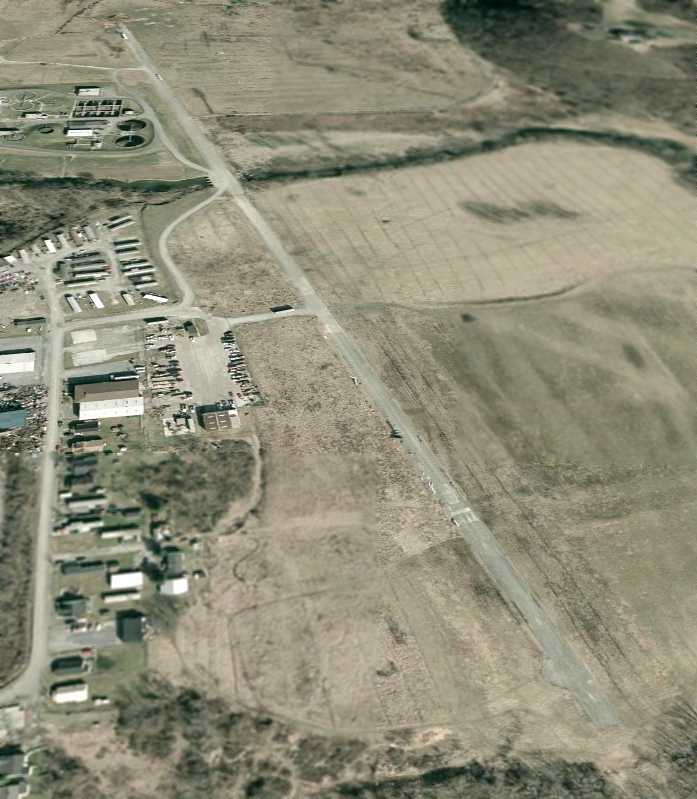 A 2015 aerial view showed no trace remaining of Bluefield Municipal Airport. The site of Bluefield Municipal Airport is located at the present-day location of Bowen Field, west of Stadium Drive. 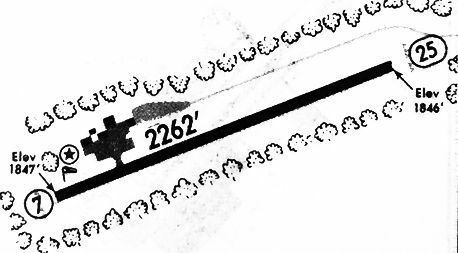 Galax Airport, as depicted on the 1935 Winston-Salem Sectional Chart. The date of establishment of this small general aviation airport to the south of Galax has not been determined. which depicted Galax as a commercial/municipal airport. the longest being the 2,500' northeast/southwest & northwest/southeast strips. A hangar was said to be painted with “Galax VA Airport”. “License applied for by J.A. 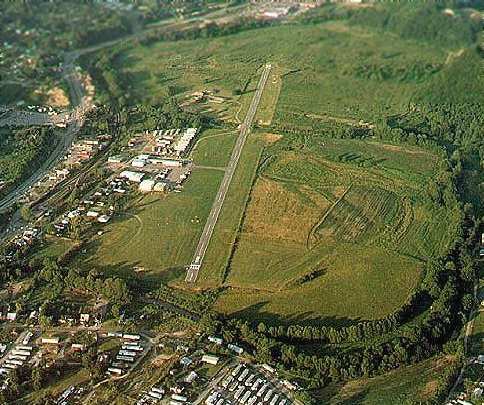 Eads 1/9/42 for site of the former Galax Airport. was a circa 1943 aerial view looking north from the 1945 AAF Airfield Directory (courtesy of Scott Murdock). 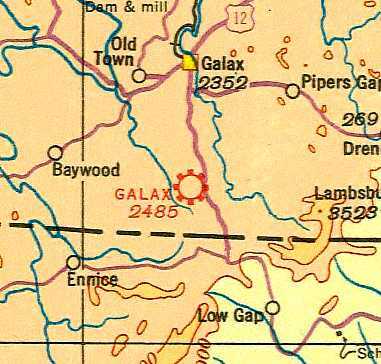 It depicted Galax as having an unpaved landing area. 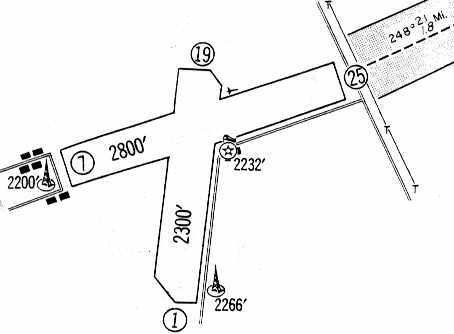 as a 71-acre rectangular property having 2 sod runways, measuring 1,800' NNW/SSE & 1,500' north/south. 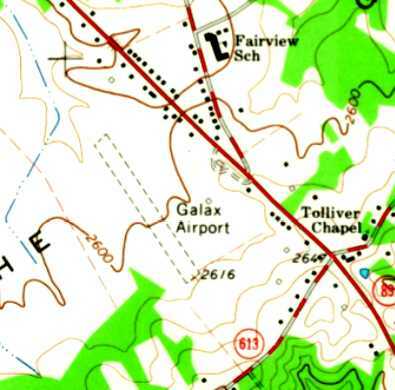 The last depiction which has been located of Galax Airport was on the 1965 USGS topo map. 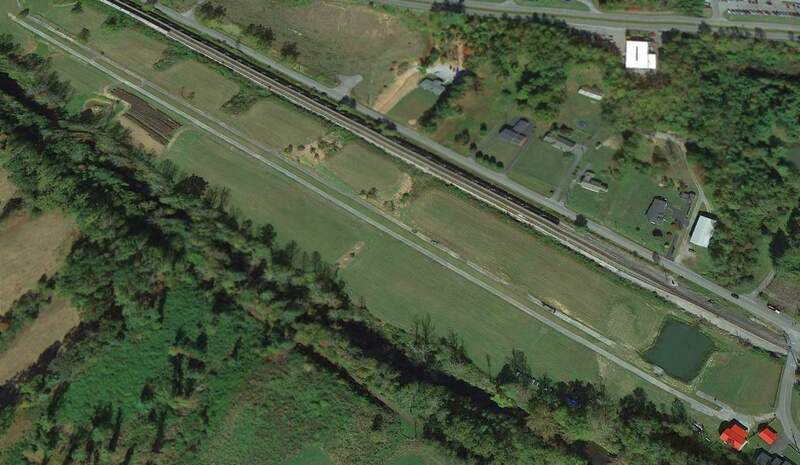 It depicted Galax as having a single unpaved northwest/southeast runway, with a single small building on the east side. It had presumably been replaced by the larger Galax Twin County Airport which had been built to the northeast of Galax. 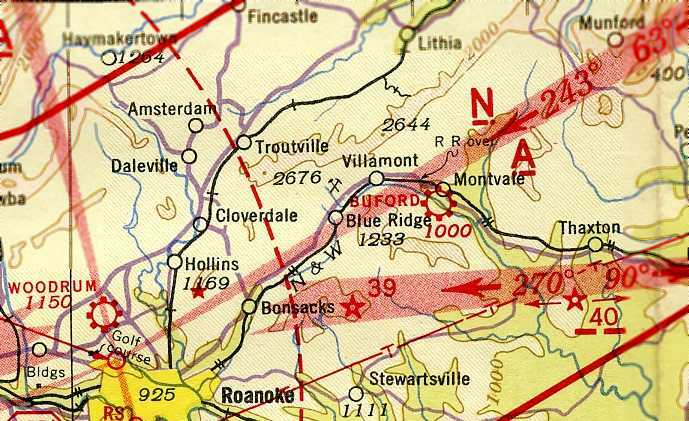 The 1978 USGS topo map no longer depicted Galax Airport. 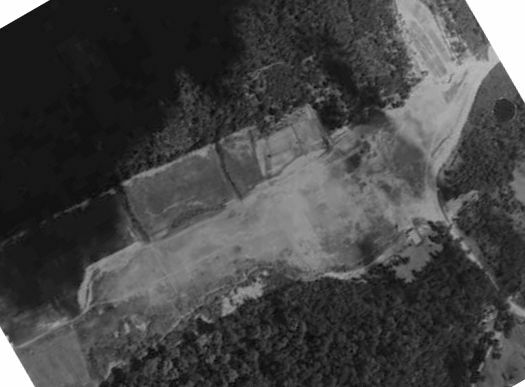 The 1995 USGS aerial view did not show any remaining trace of Galax Airport. other than the northwest/southeast clearing which corresponds to the runway alignment. 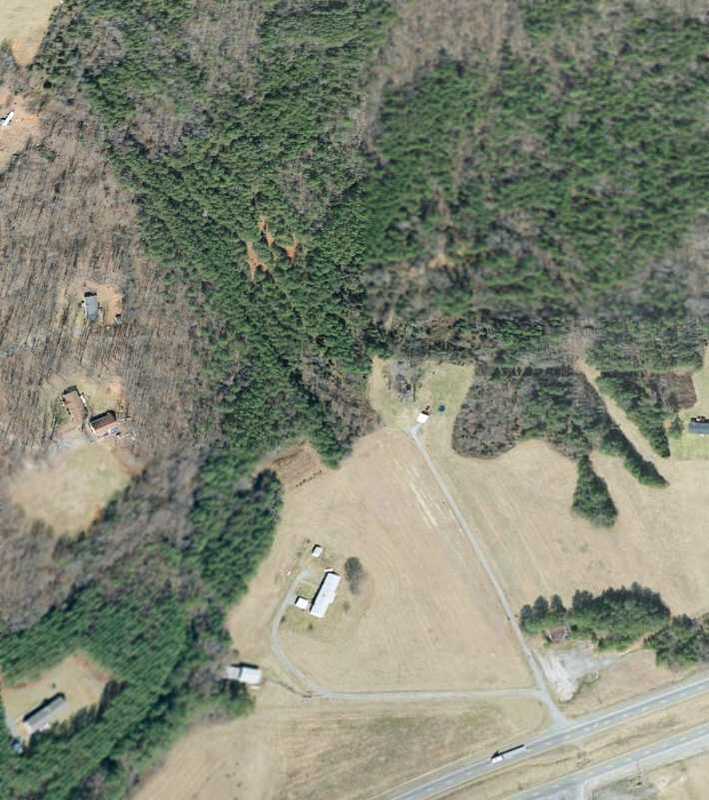 The site of Galax Airport is located west of the intersection of Route 89 & Fairview Road. A circa 1943 aerial view looking north at Covington Clifton Forge Airport from the 1945 AAF Airfield Directory (courtesy of Scott Murdock). nor listed among active airfields in The Airport Directory Company's 1937 Airport Directory (courtesy of Bob Rambo). as a 17-acre rectangular property having a single 2,400' NNE/SSW sod runway. 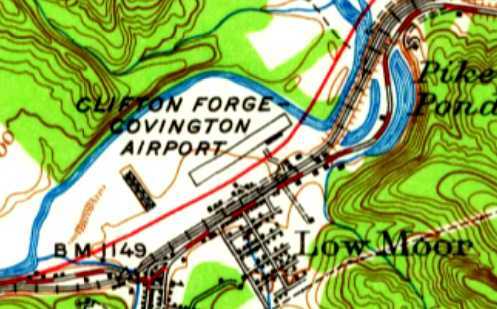 The earliest topo map depiction which has been located of Clifton Forge Covington Airport was on the 1945 USGS topo map. with a single building along the southeast side. as the 1964 USGS topo map showed the newly-built Interstate 64 passing right through the center of the airport property. 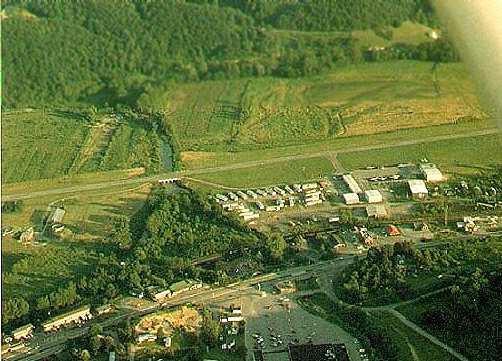 The 1995 USGS aerial view did not show any remaining trace of Clifton Forge Airport. 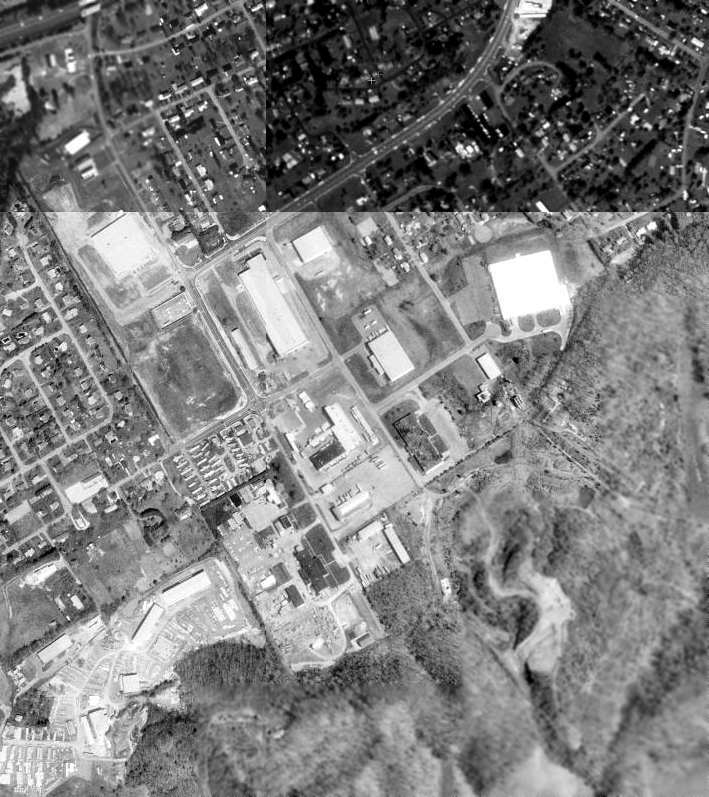 A 1/31/07 aerial view did not show any remaining trace of Clifton Forge Airport. The site of Clifton Forge Airport is located northeast of the intersection of Interstate 64 & Selma Low Moor Road. 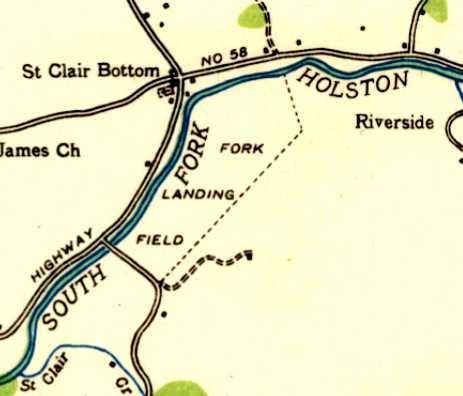 The 1935 USGS topo map labeled Chilhowie as “Landing Field”. Chilhowie Intermediate Field was not yet depicted on the 1935 Winston-Salem Sectional Chart. 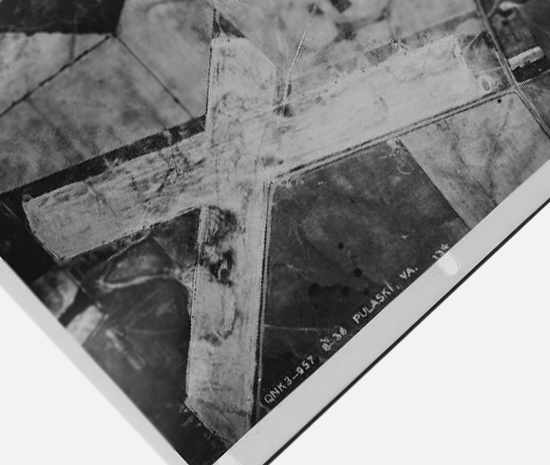 which depicted a property outline labeled simply as “Landing Field”. which were for emergency use of airliners flying airways between major cities. 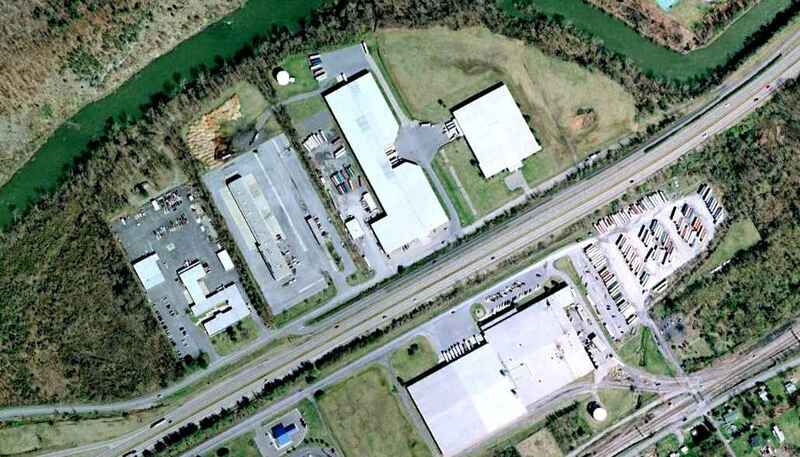 described Chilhowie as a Department of Commerce Intermediate Field, Site 28B along the Nashville-Washington airway. and to be illuminated, but not having any services. It depicted Chilhowie as having a single unpaved runway. 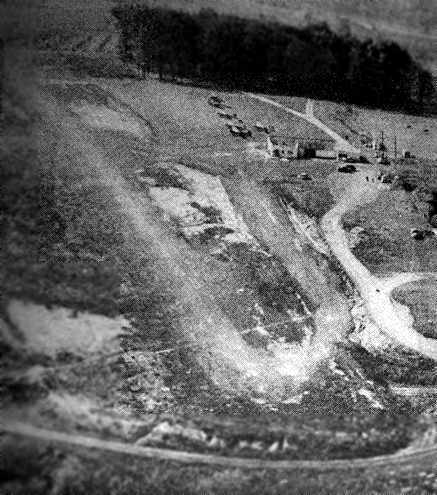 An undated aerial view depicted Chilhowie as having a single unpaved runway. as a 46-acre rectangular property having a single 3,400' northeast/southwest sod runway. to be owned by private interests, and operated by the Civil Aeronautics Administration. 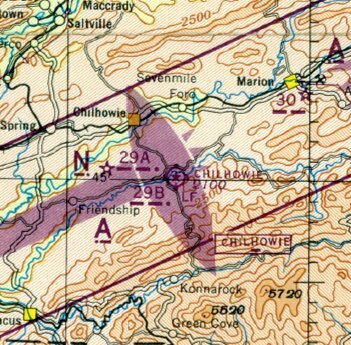 The only aeronautical chart depiction which has been located of Chilhowie Airport was on the March 1945 Winston-Salem Sectional Chart. It depicted Chilhowie as also having Commerce Department Airway Beacon #29B. but the airport was no longer labeled. 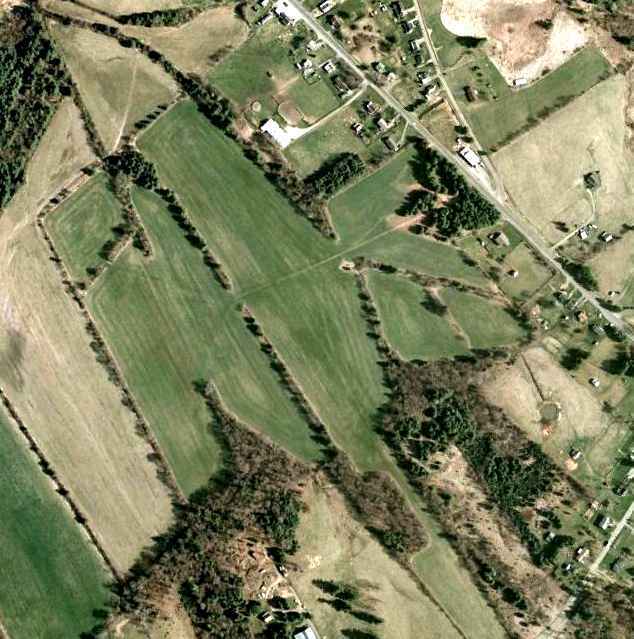 A 4/30/99 USGS aerial view looking northeast still showed a distinctive runway outline at the site of Chilhowie Airport. 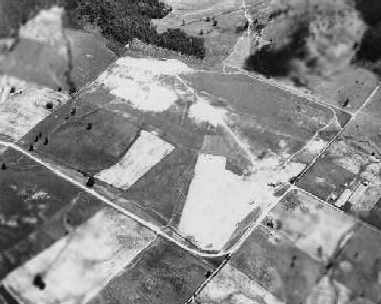 Amazingly, 60 years after Chilhowie Airport was closed, a 1/31/07 aerial view looking northeast still showed a distinctive runway outline. Jon Rained reported in 2013, “The airport is today known as 'Catron Field', and is privately owned by Curtis Pennington. The field is still active, and a couple of new hangars have even been constructed in the last few years. The site of Chilhowie Airport is located east of the intersection of Whitetop Road & Old Airport Road, appropriately enough. Buford Airport, as depicted on the August 1942 Winston-Salem Sectional Chart (courtesy of Chris Kennedy). as it was not yet depicted on the March 1935 Winston-Salem Sectional Chart (according to Chris Kennedy). was on the August 1942 Winston-Salem Sectional Chart (courtesy of Chris Kennedy). It depicted Buford as a commercial/municipal airport. 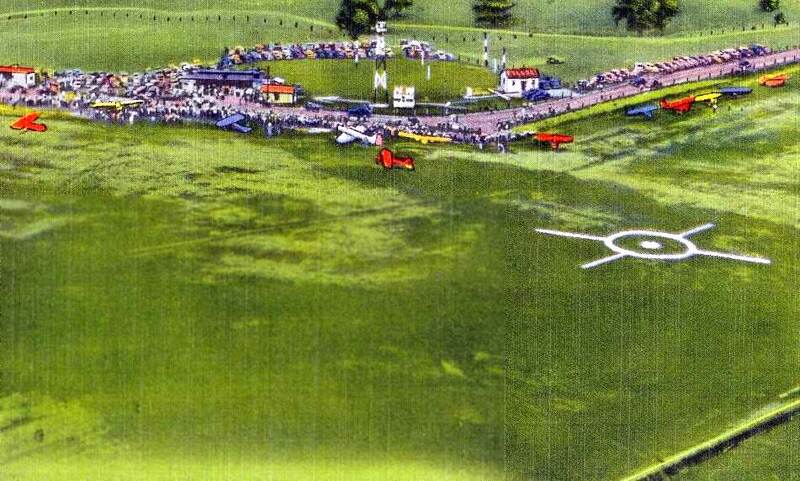 It depicted “Buford's Airport” as having a single grass runway. An undated (circa early 1940s?) photo depicting a Piper Cub in front of the 2 hangars of Buford's Airport (courtesy of Dillard Prather). According to David Brooks, Buford's may have served as a Navy Outlying Field during WW2. with Stearman type planes using the Montvale field, with some maintenance done there also. 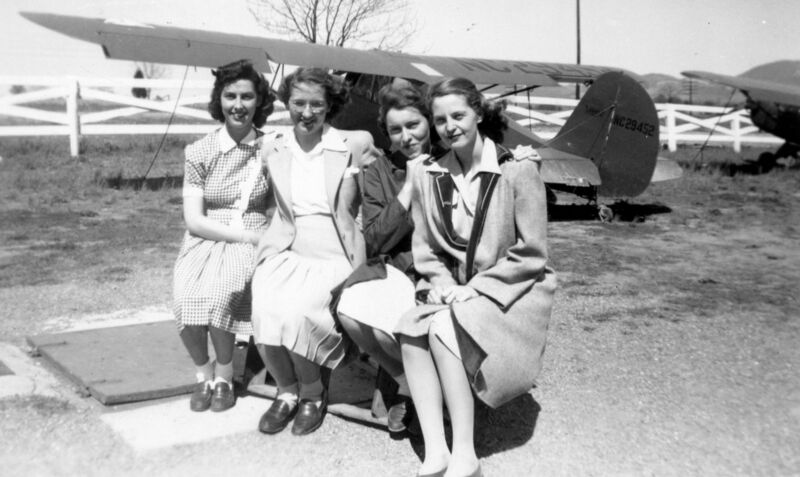 A circa 1943 photo of Valleda Pittard Chandler & several friends in front of aircraft at Buford's Airport (courtesy of Gray Chandler). A circa 1943 photo of a line of Cessnas & Pipers in front of the Buford's Airport hangar (courtesy of Gray Chandler). Note that only 1 hangar was depicted, with the 2nd hangar visible in the earlier photo evidently having been removed. 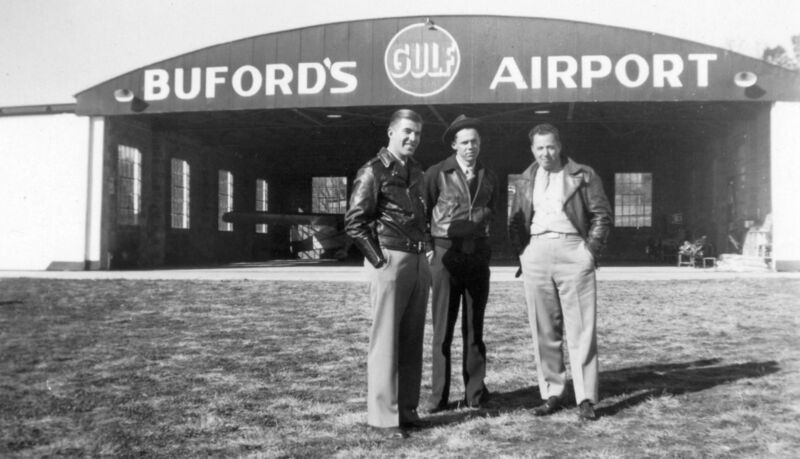 A circa 1943 photo of 3 unidentified men in front of the Buford's Airport hangar (courtesy of Gray Chandler). as a 40-acre rectangular property having a single 3,250' northwest/southeast runway. 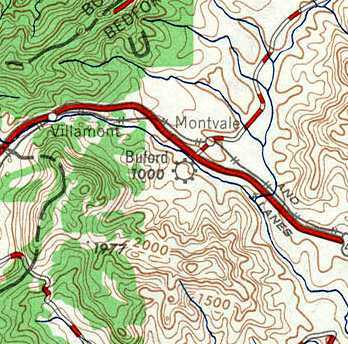 The earliest topo map depiction which has been located of Buford's Airport was on the 1950 USGS topo map. It depicted “Buford's Airport” as an unpaved field oriented northwest/southeast, with a single building on the north corner. was on the July 1954 Winston-Salem Sectional Chart (courtesy of Chris Kennedy). It depicted Buford as having a 2,900' unpaved runway. Buford Airport, as depicted on the 1957 USGS topo map. The last listing which has been located of Buford Airport was in the 1957-58 Aviation Week Airport Directory (courtesy of Chris Kennedy). It described Buford Airport as “limited” use, with a 2,900' unpaved northwest/southeast runway, managed by J.L. Buford. with a single hangar at the northwest corner. 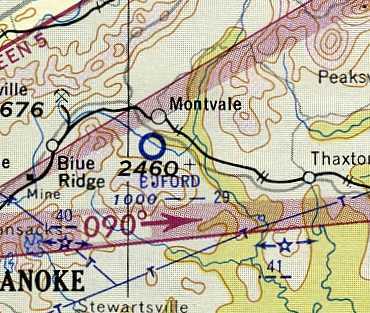 “Buford's Airport” was depicted in an unchanged fashion on the 1969 USGS topo map. as the 1970 USGS topo map depicted a cluster of 4 oil storage tanks having been built on the site. from an older mechanic when I was selling wiping products to the company there at the time. The cinder block building at the NW corner of the picture is an original WWII-era hangar. and there were no traces of the former airport. 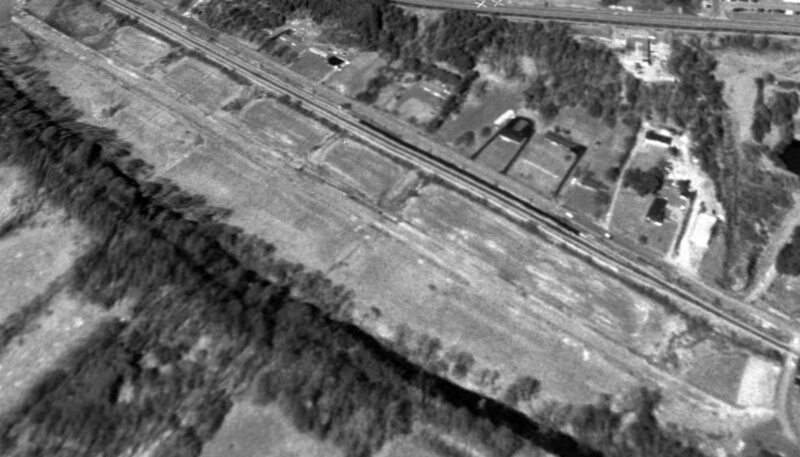 A February 1, 2007 aerial view showed the site of Buford's Airport covered by an oil storage facility. 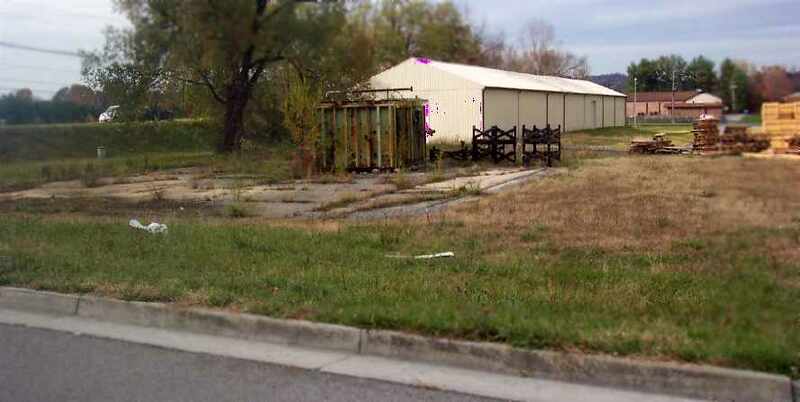 A 2011 photo by George Hill of a former hangar from Buford's Airport. According to George, “The ramp area extended straight East to where the other hangar once sat. 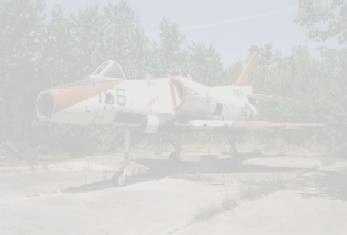 I have a picture down the road that sits over the former paved runway. The owner lived in the old inn that sits directly behind the remaining hangar. The site of Buford's Airport is located southeast of the intersection of Route 460 & Oil Terminal Road. 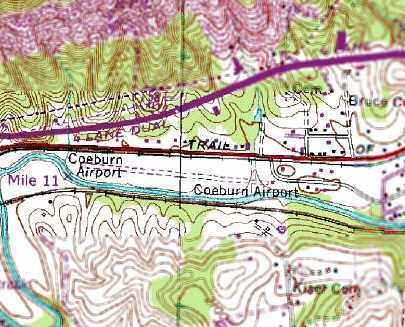 Coeburn Airport, as depicted on the 1966 USGS topo map. as it was not yet depicted on the 1939 USGS topo map. The earliest depiction which has been located of Coeburn Airport was on the 1966 USGS topo map. with one small building along the northeast side. 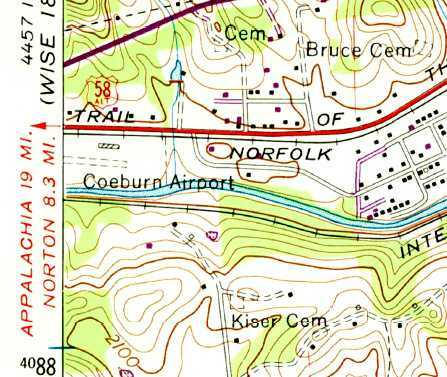 The 1991 USGS topo map depicted Coeburn Airport as having a single unpaved east/west unpaved runway. as it was no longer listed among active airfields in a 1994 airport directory (courtesy of Gwen Shafer). but it did not show any sign of recent aviation usage. 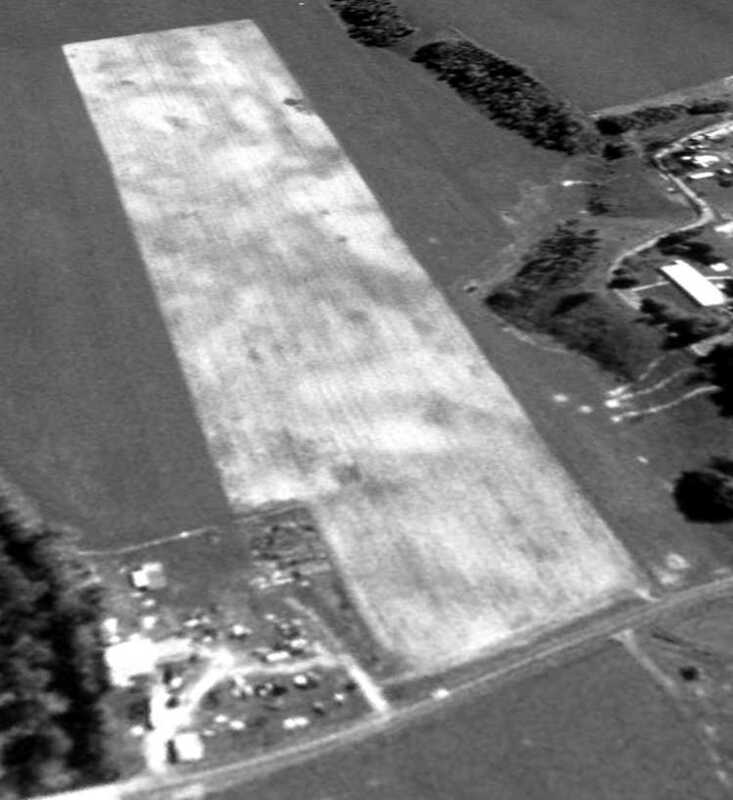 A 2013 aerial view looking northwest showed that Coeburn Airport appeared to have a paved runway, which remained intact. A single building sat just southeast of the runway. The site of Coeburn Airport is located southwest of the intersection of Route 813 & Route 658. Thanks to Steve Matda for pointing out this airfield. 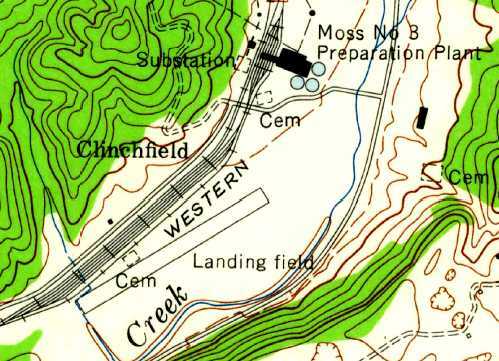 Clinchfield Airport, as depicted on the 1972 USGS topo map. 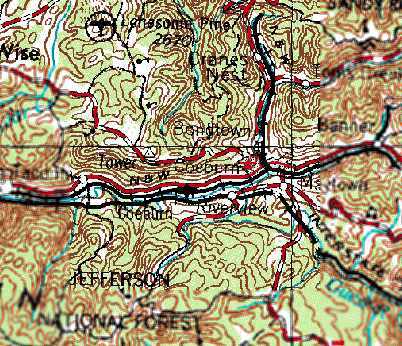 No airfield was depicted at this location on the 1941 USGS topo map. which at the time was the world's largest coal preparation facility. and Moss #2 Mine as well as the Appalachian Power Company's Clinch River Generating Plant. According to Steve Matda, “I asked my dad (Frank Matda) about it (he worked for Clinchfield for 38 years). Frank Matda recalled, “It was built when AEP built the Clinch River Powerplant for primarily for their own use shortly before 1956. It was built on Clinchfield Coal Company property, located just below the Moss #3 Preparation Plant. The lower end runway stopped just short of the concrete bridge that crossed over the railroad & creek. I thought that I was going to hit a plane that was taking off as it just cleared the bridge, on my way home one day. I believe Clinchfield also used the strip occasionally." 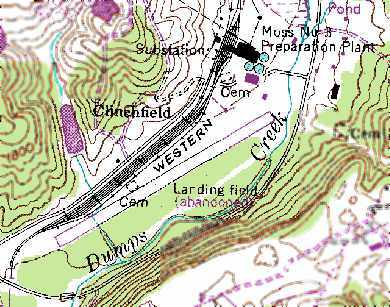 The 1958 USGS topo map depicted Clinchfield as having a single 2,000' northeast/southwest paved runway, labeled simply as “Landing Field”. 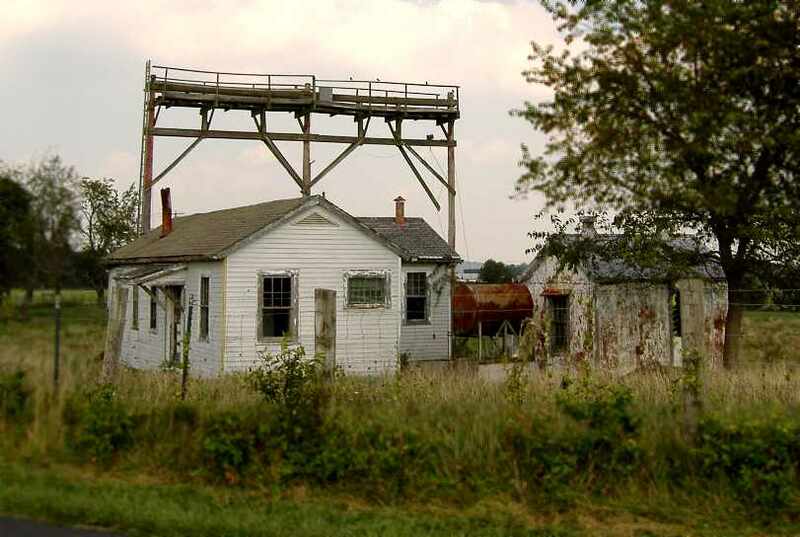 According to Frank Matda, the Clinchfield Airport was abandoned sometime around 1962.
to a total length of 3,300'. 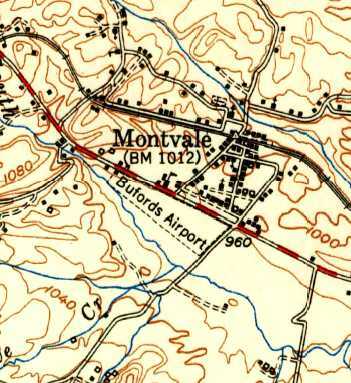 The 1974 USGS topo map depicted the airfield in an unchanged fashion. 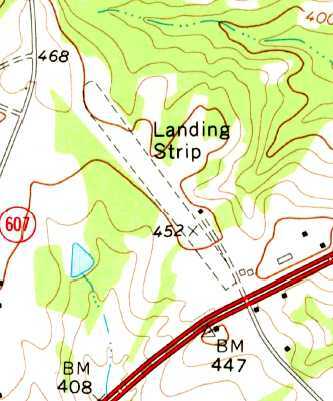 as it was labeled “Landing Field (Abandoned)” on the 1978 USGS topo map. Frank Matda recalled, “There were rumors that the FAA stopped them from using it. After it was abandoned, Clinchfield used it as a storage facility. I have spent many many man-hours driving up & down its entire length looking for material & supplies." 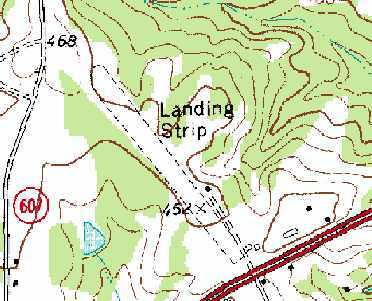 The 1989 USGS topo map labeled the field as “Landing field (abandoned)”. with the buildings of the “Moss #3 Preparation Plant” on the northeast side of the field. but the northeastern half of the strip had been covered by coal. with the southwestern half of the runway pavement still remaining intact. Steve Matda reported of the Clinchfield Airport in 2007, “It hasn't been used in at least 30 years. According to Frank Matda, “At the present time I don't know if it is still used or reclaimed." The site of the Clinchfield Airport is located northeast of the intersection of Route 615 & Route 616. The original Lee County Airport, as depicted on the March 1966 Winston-Salem Sectional Chart (courtesy of Chris Kennedy). 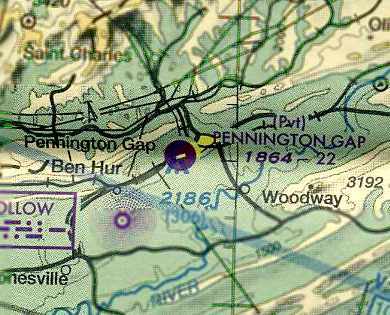 The original Lee County Airport was located just southwest of Pennington Gap. 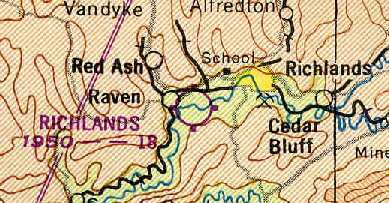 as it was not yet depicted on the 1949 USGS topo map nor on the April 1964 Winston-Salem Sectional Chart (according to Chris Kennedy). was on the March 1966 Winston-Salem Sectional Chart (courtesy of Chris Kennedy). 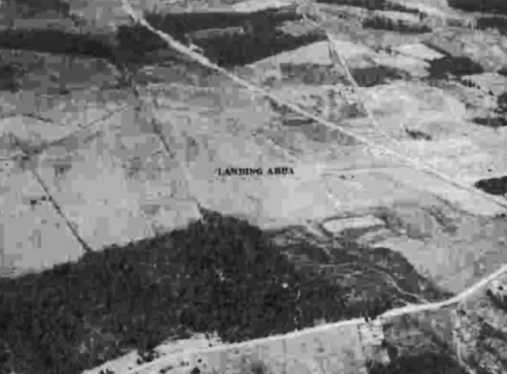 It depicted Lee County as having a 2,400' unpaved runway. as that is how it was described in the 1967 AOPA Airport Directory (according to Chris Kennedy). with a small parking ramp with several small buildings on the northwest side. It was labeled simply as “Landing Field”. 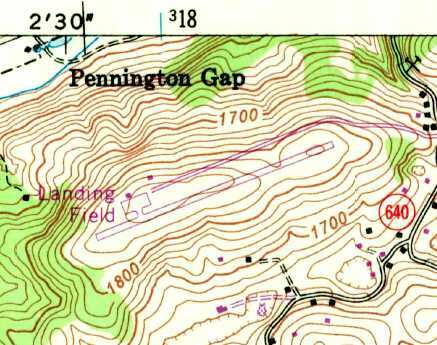 David Hensley recalled, “The old Pennington Gap airport... I did one of my solo cross-country flights there back in the late 1970s / early 1980s. I had a little trouble finding it; I had to get my location using dual VORs & then followed the railroad tracks. Lee County was still described as a public-use airfield in the 1986 Flight Guide (according to Chris Kennedy). 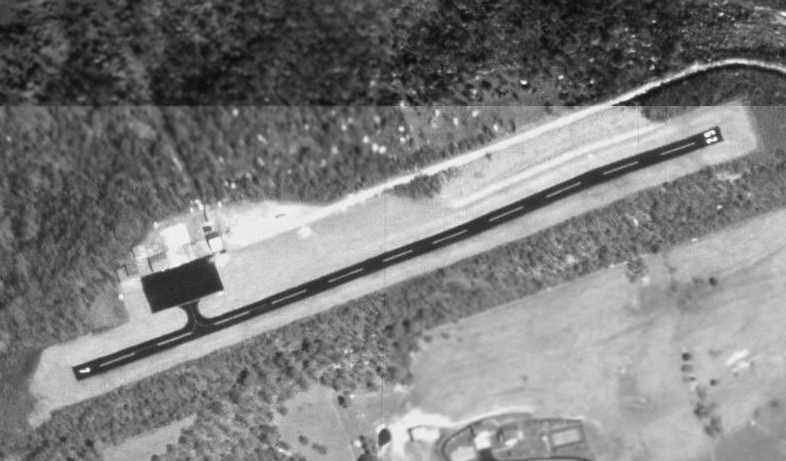 The earliest photo which has been located of the original Lee County Airport was the 1995 USGS aerial photo. was constructed several miles to the southwest in Jonesville, and opened in 2002.
and evidently stayed open for some period of time as a private airfield. 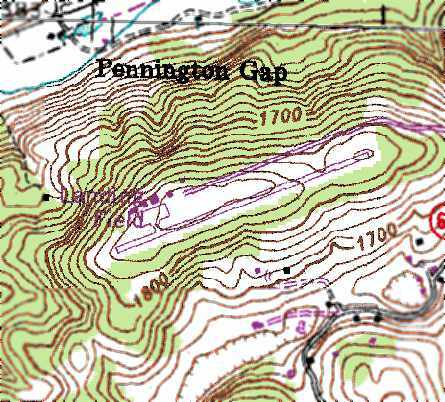 depicted the field as “Pennington Gap”, a private airfield. It was described as having a single 2,200' east/west paved runway. 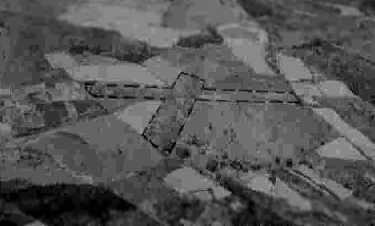 as a September 22, 2005 aerial photo showed the runway as being marked with 3 closed-runway “X” symbols. A February 1, 2007 aerial view looking east at Pennington Gap showed the runway as being marked with 3 closed-runway “X” symbols. 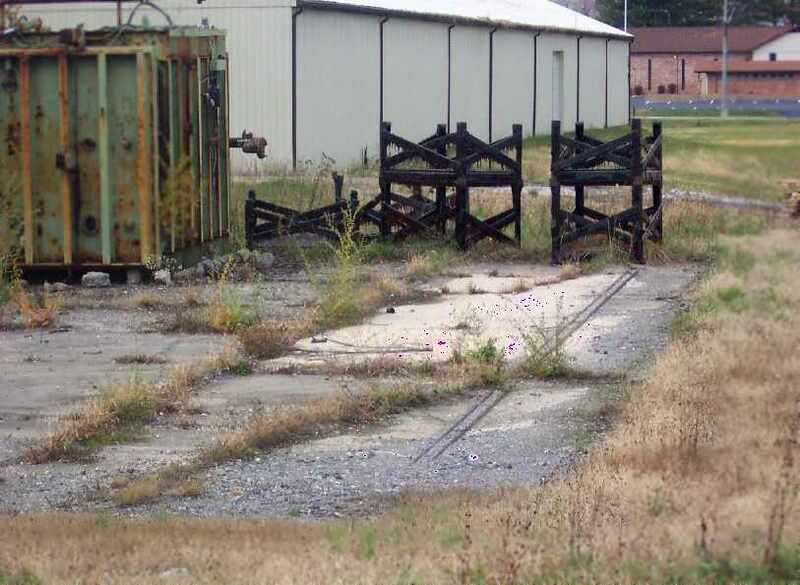 However, the field was still completely intact, with the runway, ramp, and hangars all remaining at the site. The original Lee County Airport is located at the western terminus of Route 1122. Thanks to Kyle Rodgers for pointing out this airfield. 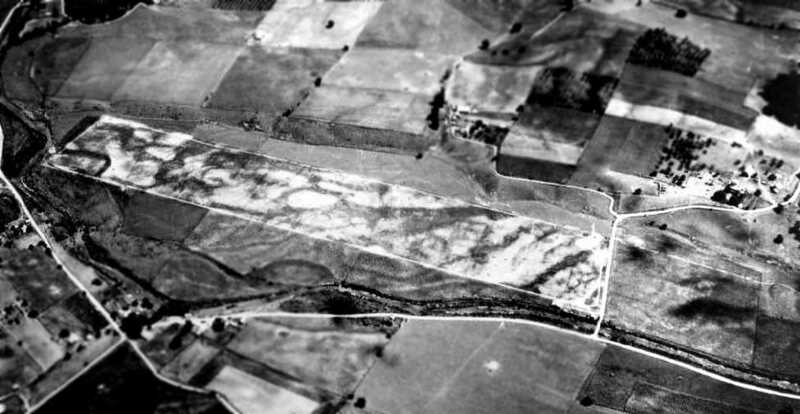 A 1936 aerial view looking northeast at the single runway of Clover Airport. according to the book "Virginia Airports" by Vera Rollo & Norman Crabill (published by the VAHS). and served as a “private-commercial field”. According to Shirley Sadler Bowen, “I am the great-neice of J.B. & Woodrow Edmondson & my father is Frank Sadler. We have an old article that states that this airport was the 1st licensed airport in the state of Virginia. My uncle was Woodrow Edmondson & J. B. Edmondson. They owned the Clover Airport back in 1936.
which depicted the field as having a single unpaved northwest/southeast runway. listed a “Halifax” private airfield, 3 miles west of Clover, bordered by U. S. Highway 360 on the south. The field was said to have a single 1,800' sod north-northwest/south-southeast runway. The field was said to have a hangar, and to offer service during the daytime. 2,020' north/south & 1,175' northwest/southeast. and the lessee & manager was listed as L.R Petus. was on the May 1941 14M Regional Aeronautical Chart (courtesy of Chris Kennedy). and listed the field as having a 2,000' unpaved runway. with 2 small buildings at the southeast corner. 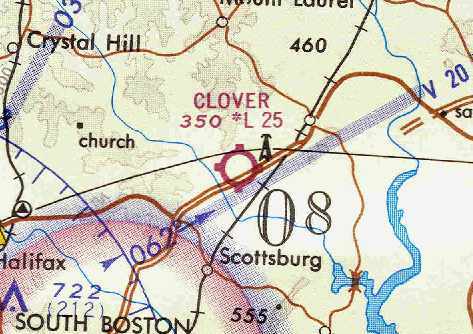 Nothing was depicted at the site of the Clover Airport on the 1954 USGS topo map. depicted Clover as a public-use airport with a single 2,500' unlighted turf runway. The field was said to offer fuel & major repairs. as having 2 turf runways: 2,500' Runway 13/31 & 1,700' Runway 4/22. The operator was listed as Frank Sadler (the nephew of Clover Airport founder Woodrow Edmondson). 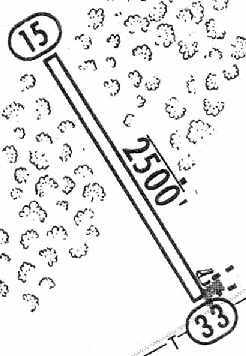 depicted Clover Airport as having a single 2,500' unpaved Runway 15/33. and a cluster of small buildings was depicted on the southeast side as well. The manager was listed as Frank Sadler. along with a single small building on the east side of the runway. Clover Airport operated as a “private-commercial field” until 1968. 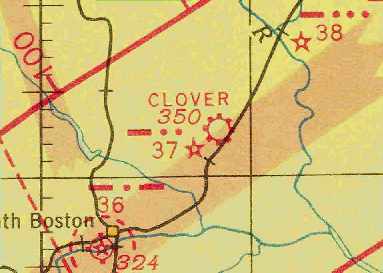 However, Clover was still depicted as an active airfield on the April 1969 Washington Sectional Chart (courtesy of Chris Kennedy). It depicted Clover as a public-use airport having a 2,500' unpaved runway. as it was no longer depicted at all on the February 1970 Cincinnati Sectional Chart (according to Chris Kennedy). but this license was canceled in 1972. It was “used for aircraft storage” in 1974, but reported as not active in 1975. Harold Schaffer reported in 2005, “I came by the old site yesterday on U.S. 360. The place is, of course, all grown up & the trees down the old turf runway are very tall now. The old pole with the skeleton of the windsock is still in place if one looks very carefully for it. even though the majority of it had been overgrown. What appeared to be the remaining hangar is on the east side of the runway. The site of Clover Airport is located northwest of the intersection of Route 360 & Piney Creek Road. Thanks to Harold Schaffer for pointing out this airfield. 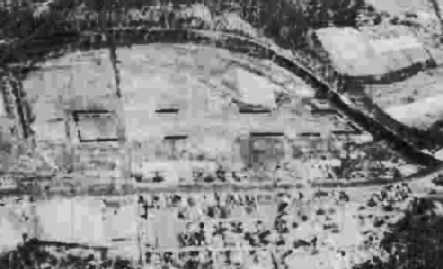 An August 1936 aerial view of Loving Field. The date of construction of this small airfield has not been determined. as it was not yet depicted at all on the 1935 Winston-Salem Airway Chart. 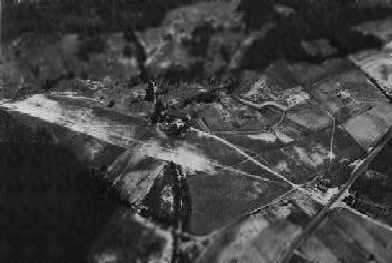 The earliest depiction of the field which has been located was an August 1936 aerial photo. but did not appear to depict any buildings at the field. Intermediate Fields were established for the emergency use of commercial aircraft flying between major cities. 2,750' east/west & 2,300' north/south. in The Airport Directory Company's 1941 Airport Directory (according to Chris Kennedy). as that is how it was depicted on the August 1942 Winston-Salem Sectional Chart (courtesy of Chris Kennedy). as that is how it was depicted on the April 1944 Winston-Salem Sectional Chart (courtesy of Chris Kennedy). described Pulaski as the Department of Commerce's Intermediate Field #35A along the Nashville-Washington Airway. It described the field as having a 2,800' unpaved runway. 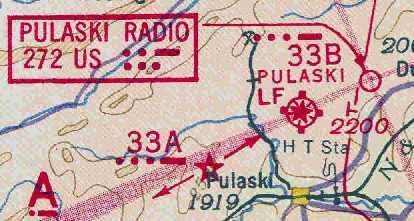 The directory described Pulaski as a 70-acre cross-shaped field within which were 2 sod runways, measuring 2,650' northeast/southwest & 2,300' NNE/SSW. to be privately owned, but operated by the Civil Aeronautics Administration. 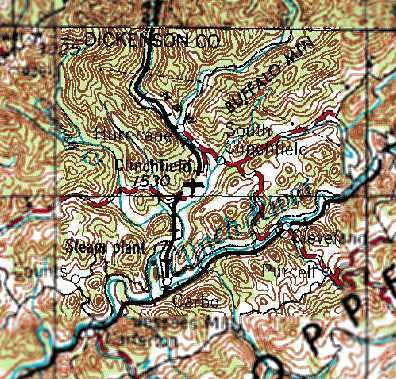 Pulaski Field was not depicted at all on the 1945 USGS topo map. once again listed the Pulaski airfield as the "CAA Intermediate Field Site #33B" (which may have been erroneous). It was described as a "class 1" airfield, owned by the City & operated by the CAA (Civilian Aeronautics Administration). 2,650' northeast/southwest & 2,300' north-northeast/south-southwest. The manager was listed as M. Lawley. showing a total of 12 aircraft on the field, with a large crowd, presumably at the airport for some kind of event. as that is how it was labeled on the October 1948 Winston-Salem Sectional Chart (courtesy of Chris Kennedy). and was described as having a 2,800' unpaved runway. according to the book "Virginia Airports" (published by the VAHS). The license was granted on 8/23/49 to Porter Ham, as a commercial, turf field. 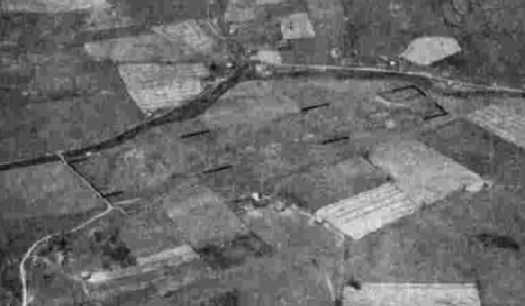 A 1949 aerial view showing 3 or 4 aircraft parked at Loving Field. as having 2 unpaved runways: 2,800' Runway 7/25 & 2,300' Runway 1/19. which must have made operations from that runway somewhat interesting. A beacon & 2 small buildings were depicted just southeast of the runway intersection. the operating license for Loving Field was canceled on 11/21/60, at the Town of Pulaski's request. Loving Field was closed by 1960, as it was no longer listed in the 1960 Jeppesen Airway Manual (according to Chris Kennedy). which was dedicated in 1962.
to promote economic growth & Piedmont Airlines was soon flying Martin 404s into Pulaski County. the complex was quickly overtaken by wildlife & local urchins like myself. It was a special treat to have our own airport to play with. 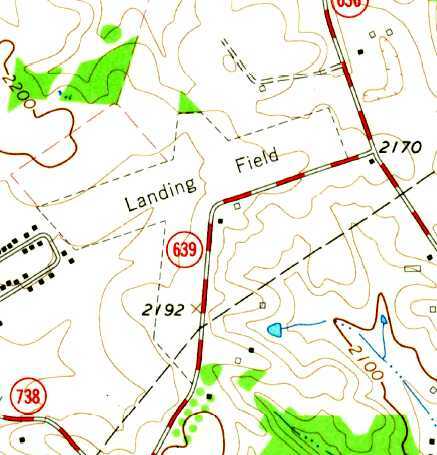 The 1965 USGS topo map depicted a unpaved runways, labeled as “Landing Field”. The 1971 USGS topo map depicted the airfield in an unchanged fashion. The 1978 USGS topo map no longer depicted any airport features at the site of Loving Field. 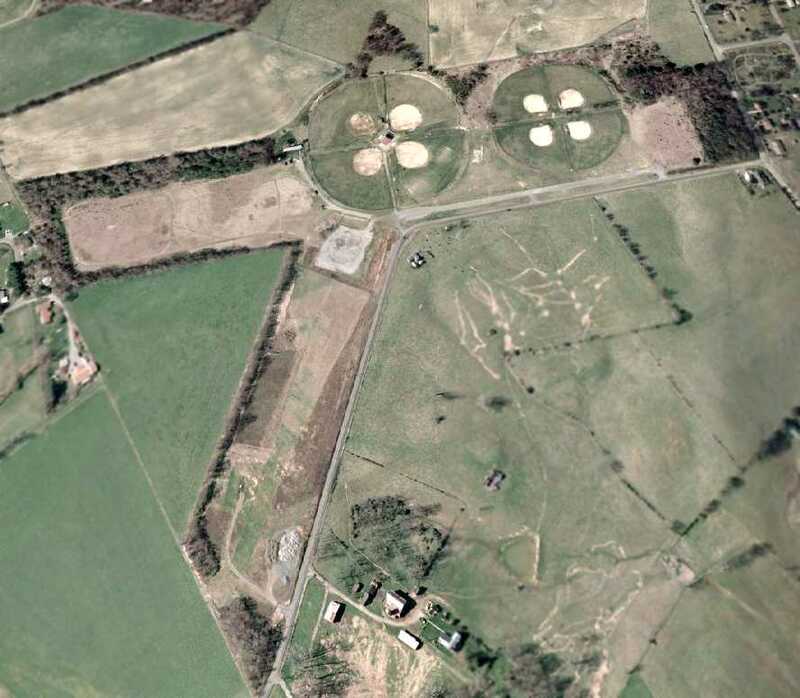 even though several baseball diamonds had been built over the center of the former airfield. There were a few small buildings just southeast of the runway intersection which could possibly date from the site's days as an airfield. 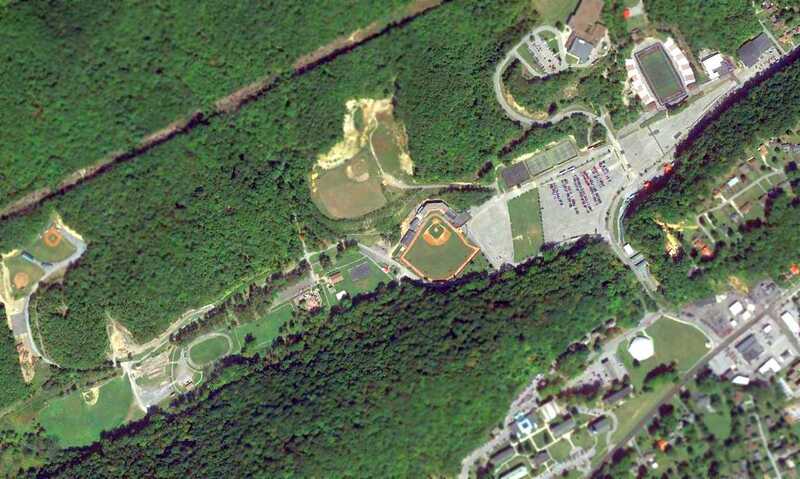 which consists of 162 acres, 30 of which have been redeveloped into baseball/softball fields). Some 90 acres are leased to a local farmer, while the remaining is undeveloped, open space. as an ultralight aircraft operator mentions flying from the site. A 2005 photo by Carl Bryant of airfield buildings which remain standing at the site of Loving Field. Carl Bryant reported in 2005, “Loving Field is owned by the town of Pulaski & is currently being used as a sports complex. and the east end of the east/west runway. The southern half of the north/south strip is still open grass & is used by local ultralight enthusiasts. and 3 original buildings still stand at the intersection of the 2 runways. about 50 yards east of the 3 remaining buildings & across the road from the softball field parking lot. The thing I found most unusual about this airport was the fact that all the buildings were across the road from the grass runways. Planes in the hangar actually had to be pushed across the road & through the grass parking lot to get to the field! and perhaps this is why it soon fell apart & had to be scrapped. is a large farm building, a silo I think. Thanks to Lester Hollans for pointing out this airfield. 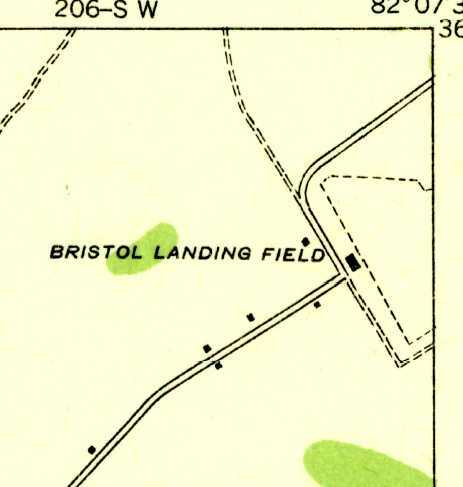 The 1934 USGS topo map depicted Bristol Landing Field as an irregularly-shaped outline with a single building at the west side. and another local businessman opened a landing field 2 miles east of Bristol, Virginia. Known simply as the Bristol Airport, the field had 2 grass runways & a metal hangar. The privately owned airport usually had 8-10 based aircraft at any one time." in the hopes of generating some commercial activity at the field. They bought 2 airplanes & hired a pilot, but customers were scarce during the depression. and decided that teaching her would stimulate business. Jane jumped at the chance. She quickly soloed & earned her license. Other local people took up flying at the field as well, but it was 1933 before Bristol was officially designated on the nation's aviation map. was exploring the possibility of opening mail routes in the south. A route from D.C. to Nashville with stops at Kingsport & Knoxville was considered. By the spring of 1933, Eastern Air Transport purchased the Ludington Line & carried through on the plan. Eastern made several test flights to Bristol to determine local interest before adding the city to its mail route known as 'CAM-23'. The local backing was there, and the Tri-Cities area received its 1st air service through the Bristol Airport." According to the website of the present-day Tri-Cities Regional Airport, "In February of 1934 the government canceled all airline mail contracts due to a bidding controversy. President Roosevelt turned the air mail business over to the Army. It was a disastrous decision. Army pilots, unfamiliar with the routes, flew open-cockpit planes during one of the worst winters in years. In the 1st week, plane crashes killed five pilots & 6 were critically injured. There was an immediate public outcry & Roosevelt conceded that the idea had been a mistake. New airline bids were called for & by mid-May the airlines returned to flying the mail. which continued the service flying Stinson 'Model A' Tri-Motors. established Appalachian Flying Service at the Bristol Airport. 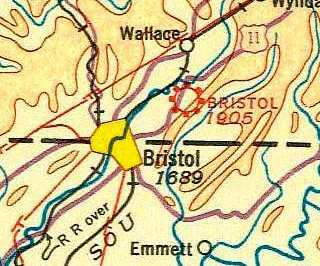 The earliest depiction which has been located of Bristol Airport was on the 1934 USGS topo map. It depicted Bristol Landing Field as an irregularly-shaped outline with a single building at the west side. "By the mid-1930s Kingsport & Johnson City were trying to obtain their own air service. 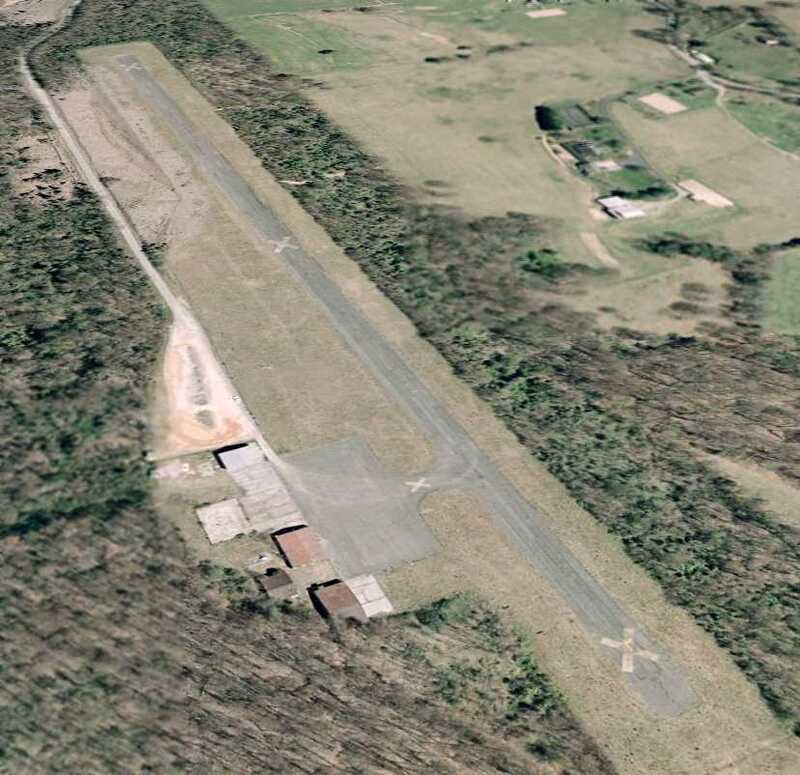 Johnson City’s privately owned airfield was not large enough to be practical. A grass airstrip in the Lovedale section of Kingsport was also too small & lacked public support for expansion." The earliest aeronautical chart depiction which has been located of Bristol Airport was on a 1935 Regional Aeronautical Chart. 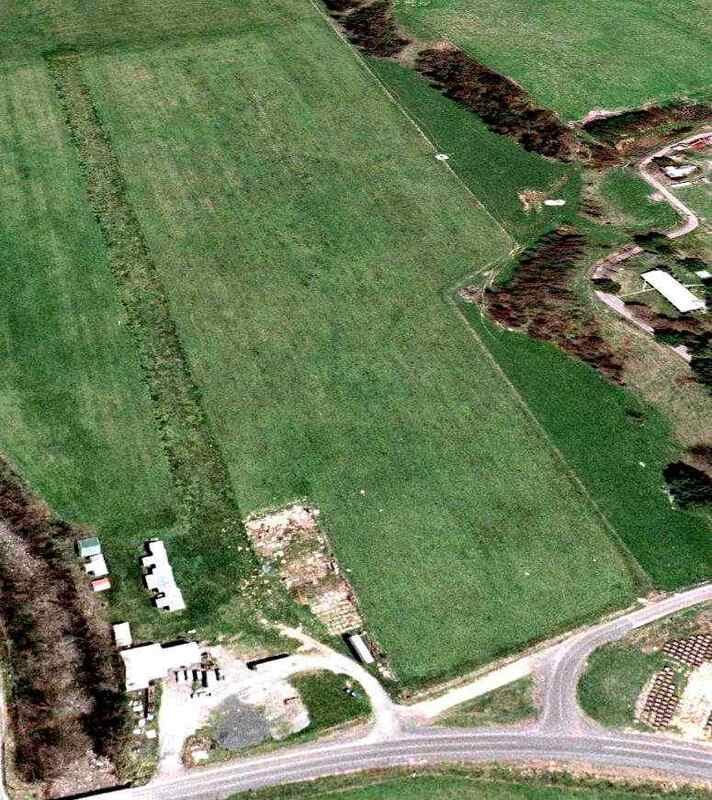 The 1/1/36 Department of Commerce Airway Bulletin described Bristol as a municipal airport as a commercial field, consisting of an irregularly-shaped sod field. It was said to have 2 runways: 2,400' northeast/southwest & 1,900 northwest/southeast. A hangar was said to be marked with “Bristol Airport” on its roof. The field was said to offer facilities for servicing aircraft, day only. depicted the field as consisting of a rectangular grass field. An aerial photo looking southwest at the Bristol Airport from The Airport Directory Company's 1937 Airports Directory (courtesy of Bob Rambo). The field was described as having 2 sod runways, with the longest being the 2,400' northeast/southwest strip. A single hangar depicted in the aerial photo in the directory was said to have "Bristol" marked on the roof. to build a regional airport equidistant between them. at a facility with a USAAF plant code of “UN”. The L-7s were Monocoupe 90AFs which were delivered to the USAAF & used in France. According to the website of the present-day Tri-Cities Regional Airport, the Bristol Airport “was abandoned in 1943." Bristol Airport was no longer depicted on the March 1945 Winston-Salem Sectional Chart. 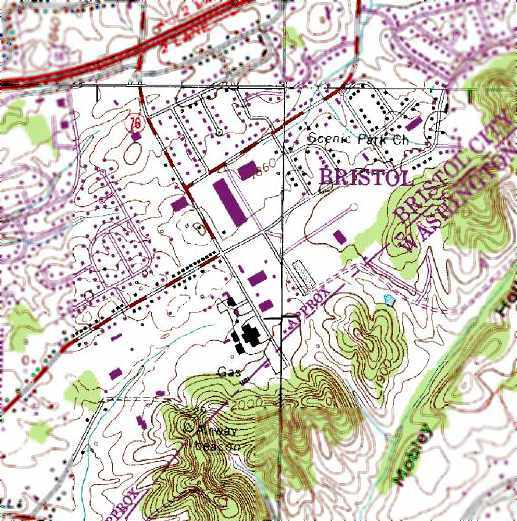 The 1960 USGS topo map continued to depict “Bristol Landing Field” as an irregularly-shaped outline with a single building at the west side. instead showing several streets having been built through the site. 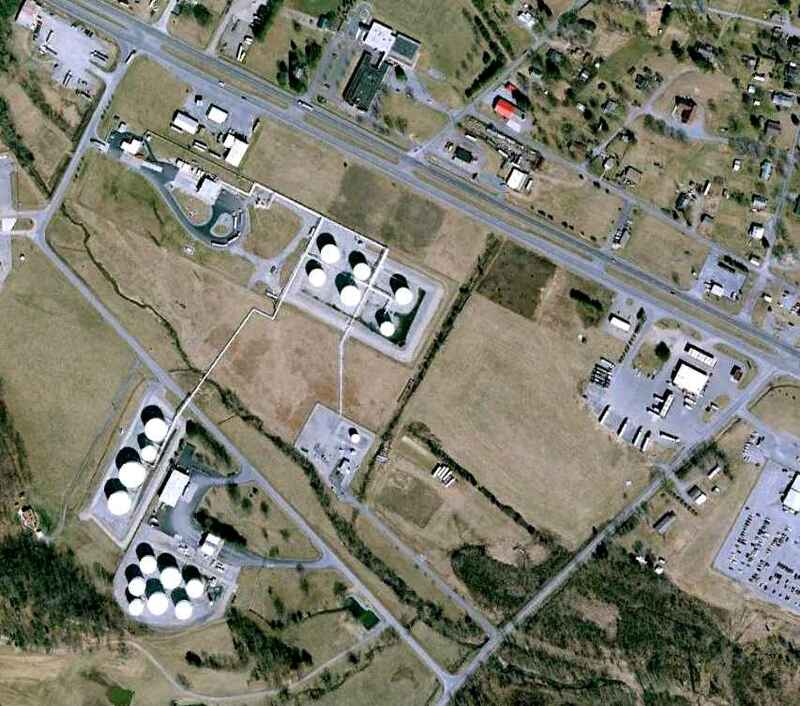 According to Shawn Carver, the site of the Bristol Airport "is located on Old Airport Road near I-81. I believe it was located on the site of what is now an industrial warehouse area. The 1st place I ever lived in (until I was 1 year old) is directly behind this site. but did not depict any other traces of the former airport. 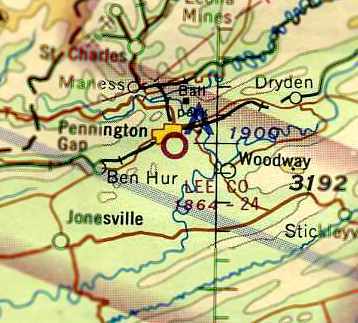 The 1991 USGS topo map still depicted an "Airway Beacon" on a hill just to the south of the site of the former airport. which might just be one of the original airport buildings." A 2007 photo by Steve Matda looking northwest at the foundation of the Bristol Airport hangar. 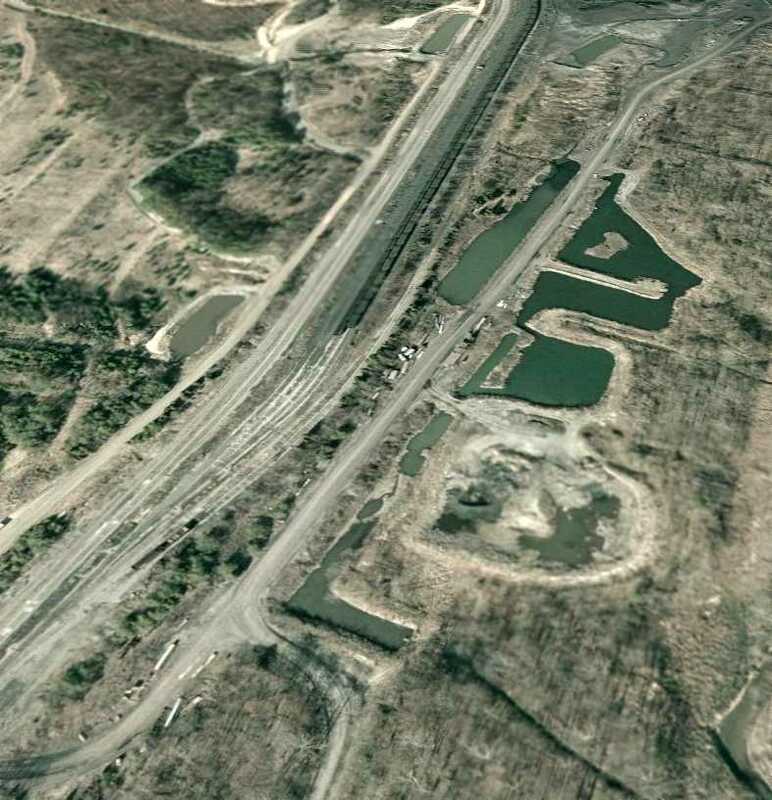 Steve reported, “Bonham Road is to the left on the embankment & runs behind the trees & tan warehouse. Richlands Airport, as depicted on the 1949 Winston-Salem Sectional Chart (courtesy of Chris Kennedy). an operating license for Richlands Airport was applied for in 11/14/44 by Hubert Altizer of "Clinch Valley Airways". and was later transferred to John Mullins & George Fitch. From 1945-52 the Richlands Airport operator & owner was Grady Dalton. was on the 1949 Winston-Salem Sectional Chart (courtesy of Chris Kennedy). 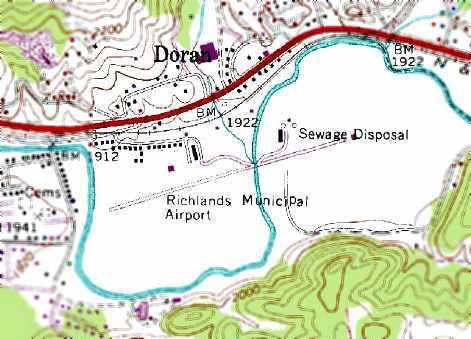 The 1950 USGS topo map depicted Richlands Airport as having a single unpaved northeast/southwest runway. the original Richlands Airport "was a grass strip located just across the Clinch River, to the west of the [current paved runway] airport. In fact, one could stand on the end of the paved Runway 8, and almost throw a rock to the east end of the old grass runway, which is now a subdivision." 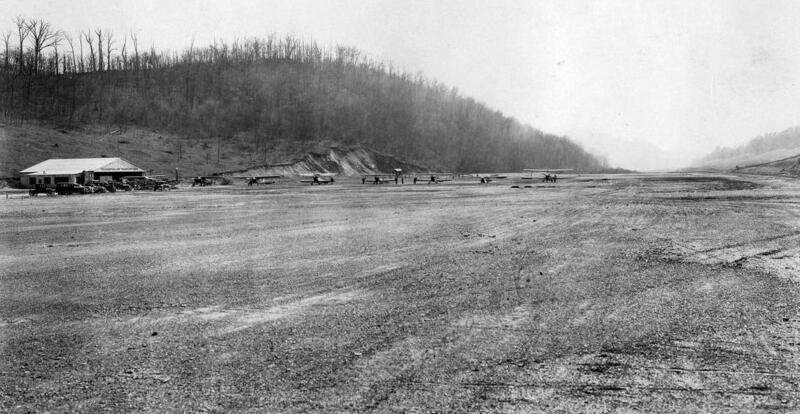 looking west-northwest at the original unpaved Richlands runway (courtesy of Frank White). 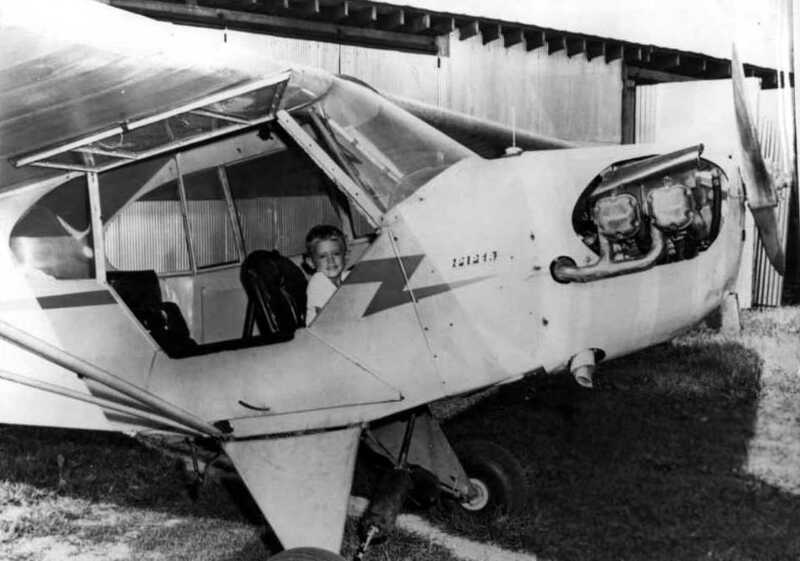 The earliest photo which has been located showing an aircraft at the Richlands Airport was a late 1950s photo of Buster Roisch in a Piper Cub. In the words of Frank Grose, "The old airport (west of the river) was still in operation in 1961 or 1962.
from some fellow by the name of Shultz, who had dreams of starting an FBO there. My 2nd ride was also from that field in Grady Dalton's Super Cub with Fleet Underwood (a Hellcat pilot in the Pacific during WW2). He let me do most of the flying. That was the 1st time I'd touched the controls of an airplane, but I recall it like it was yesterday. We took off west, and made a tear-drop turn back toward the airfield. Fleet gave me the controls as we approached the airport. It felt good! My inner voice said to me, 'This is what you HAVE to do.' That was the moment I became a pilot. By the time I started taking lessons in the early summer of 1963, the new airport had been opened. And it was still 'new' that summer. Later, Bob Mullens got Bill Haymaker to come to be the instructor. I flew with him a couple of times in a Cessna 150 in 1964." as having a single paved 2,000' Runway 8/26. with a single 1,900' sod Runway 9/27. According to Chris Kennedy, the 1971 Flight guide described Richlands Airport as having an 1,800' unpaved runway. A Fall 1974 photo of Charles Toman & James Hackman in front of the Reliance Electric Company Cessna Citation they had just landed at Richlands. Jim Hackman recalled, “It was probably part of a multi-stop day. The Citation replaced a B90 King Air & we had a lot of small short places to accommodate. The water across the Richlands runway also occurred on our visit. After we landed it rained & the drainage ditch visible on the drawing rose over the runway. 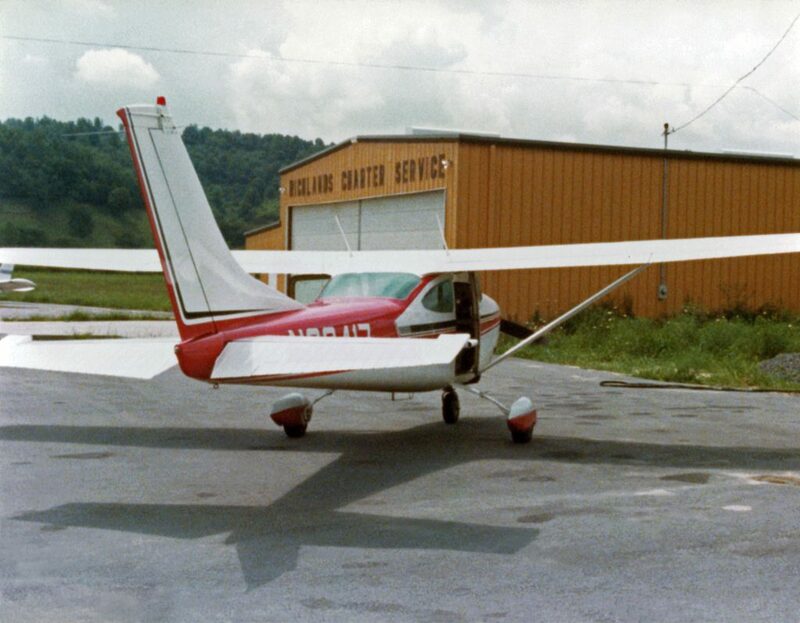 An 8/12/77 photo By Kenneth Keeton of a Cessna 1982 in front of the Richlands Charter Service hangar. which had evidently replaced the grass runway at some point between 1971-78. A 1981 aerial photo by Frank White looking east at Richlands Municipal Airport, while the airport was still open. showing the bridge (center-left of photo) which carried the runway over the Clinch River. A 1981 closeup by Frank White of the ramp at Richlands Municipal Airport. Frank observed, “Looking at this picture, I can still smell the fresh-cut grass as if it were this morning sometime." A 1981 photo by Frank White of floodwaters over the runway at Richlands Municipal Airport. "Here's what typically happened on the runway after a couple days of rain! Yikes! in a flood prone river basin." The paved runway extended further to the east, being carried by a bridge across the Clinch River. as Frank White recalled "whenever it rained a lot, the airport would have to close because of flooding." the airfield consisted of a single 3,427' asphalt Runway 8/26. Frank White added, "An interesting story surrounds the old airport. and was able to acquire a Super Cub, under some kind of state grant, for use with the CAP. (which was actually someone's garage at the edge of the airport property). Well, Virginia never came & picked up the airplane, and there it sat for years & years. so theoretically, it didn't belong to anyone from the time the CAP disbanded until Mr. Dalton passed away." the record of it finally came to light & the State came & reclaimed the airplane." and that there was an FBO & fuel. a few miles to the southeast. showed the runway remained intact, with some markings still visible. The ramp appeared to be used for storage. one mile west of the town of Richlands.